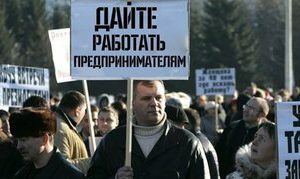 BelarusDigest > All > What Is at Stake in the Small Traders Protests? On 1 January 2016, a new edict came into force in Belarus demanding that small traders who sell imported goods must provide details of their origin. The edict was based on laws for small traders introduced by the Eurasian Customs Union that came into effect in January 2013. As a result, most outlets selling light industrial goods have closed. The traders held an “anti-crisis forum” at the Hotel Belarus’ on January 11, but to date the government has refused to rectify the situation. Moreover, the impasse seems likely to continue at least until the convocation of the next Business Forum on January 25. 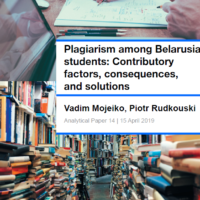 While the difficulties for such forms of business in Belarus date back more than a decade, the current conflict represents the most serious dilemma to date for both the authorities and small traders. The bill requests that traders selling imported goods — mostly from Russia — must provide certificates indicating their origin. Traditionally, Russian exporters have either declined to provide such information or fabricated it. The government’s stated goal to procure transparency in trade masks a larger concern that cheap imported goods undermine the sale of Belarusian products. In turn, the traders insist that the quality of local manufacturing is both inferior to and more expensive than imports. The mass desertion of their market stalls clearly surprised the authorities, and the Ministry of Trade acknowledged that 68% of outlets had remained closed, which it attributed in official parlance to the holiday season. Yet according to the head of the business association Perspektyva, Anatol Šumchanka, 90% of traders nationwide abandoned their businesses during the holiday season, which is normally their peak period for sales. The president of Belarus, Aliaksandr Lukashenka, made reference to the stoppage of sales on January 14 at a meeting related to the protection of the state border. He noted that advance warning of the decree was given last year to self-employed small traders and commented that he was puzzled by recent events. Decree 222, he added, constitutes the first step in trade transparency, thus implying that more measures would follow. For the president, the struggles of the state sector in the current dire economic climate remain the priority and thus traders must sell homemade products. An estimated 1,500 small traders attended the anti-crisis forum held at the Hotel Belarus, with a further 800 gathering outside in the foyer. Šumchanka addressed the assembled and complained about the lack of prior consultation of the new decree. He stressed that traders do not oppose the certification of goods, but the authorities introduced the laws without consultation. Šumchanka cited a former judge of the Constitutional Court, Michail Pastuchoŭ, who analysed Edict 222 and reached the conclusion that the document illegally restricted the rights of citizens. Šumchanka​ proposed the gathering of 50,000 signatures to introduce a new law into Parliament on behalf of the traders to create more favourable conditions for small businesses. Perhaps unsurprisingly some participants wanted more direct action and in the foyer Minsk trader Aliaksandr Makajeŭ called for a mass protest at October Square on January 16. Notably also, former presidential candidate Taссiana Karatkievič attended the forum, as did two (invited) officials from the government, Andrej Miaškoŭ (Ministry of Trade) and Valery Chomčanka (Ministry of Economy). Šumchanka​, however, who highlighted the campaign on his Facebook page (Anatoliy Shumchenko), responded angrily to what he perceived as the attempt to politicise the protests and commented that radical actions would not bring the desired results. At the same time, Miaškoŭ​ provided an overt warning that traders would be held responsible for “violating established working hours” should they fail to report to work the next day. The vast majority ignored the threat. Šumchanka referred to political activists as “scum” and “provocateurs” who should hold their own events, but some political activists perceived the dispute as a potential for more coordinated anti-government actions, perhaps based on Šumchanka’s own estimate that the new decree encompasses potentially not merely 37,000 individual traders, but also over 120,000 businesses operating in shopping centres and as private companies. The gathering at the Hotel Belarus also comprised delegates from all parts of the country, indicating the breadth of the protests. The leader of Perspektyva believes that the government logically must come to an agreement with traders who have no alternative but to oppose a law that undermines their very livelihood. Opposition leader Mikalaj Statkievič provided an interview to Belsat TV on the same day as the Anti-Crisis Forum. He made it clear that if the authorities failed to respond to demands of ‘democrats’ for electoral reform, they should be prepared to gather “in the Square” in order to “maintain dignity” and demonstrate their willingness to fight for their rights. Street actions, in his view, remain the sole mechanism to influence the authorities. He revealed that he is preparing a group of 150-200 committed and “courageous” people who are prepared to lead street rallies. The call for confrontation contrasted with the milder approach of Šumchanka​, who although equally dismissive of the government’s responses to date, still holds out the hope of reaching agreement. The dispute between the government and small traders carries potential for broader protests, especially given the dilemmas of large companies who are cutting the workforce and dealing with high costs of imported materials. Moreover, an immediate solution appears unlikely as the suppliers of the imported goods refuse to provide documentation of their origin. Such trade originated in Soviet times and constitutes an essential mechanism for supply of consumer products in a command economy. And while the majority of small traders in Minsk on January 11 seek economic rather than political solutions — such as a change of government — their frustration is evident. Belarus can ill afford a sustained mass protest given the forecasted sluggish GDP growth of 0.3% in 2016 — a prediction itself based on a highly implausible oil price of US$50 per barrel. A wise government would consider a compromise solution. For many first-time visitors to Belarus the limit of ambition and adventure often extends no further than the boundaries of inner city Minsk, yet a voyage of discovery exists elsewhere in the other major cities, museum towns and the natural world. This article, the first of a two-parter, introduces a number of these treasures in the Western half of the country, where the elegance of Hrodna (also spelled Grodno), the frontier bustle of Brest, the palaces and castles of Mir, Niasviž and Navahrudak and the natural beauty of Bielaviežskaja Pušča National Park all await the curious traveller. In strategic and geographical terms, Belarus played a number of important roles as the most Westerly of the former Soviet Union’s republics and it comes as no surprise that this feature continues to dominate its attractions today. Nestling in the north-western corner lies the city of Hrodna. Just 20 kilometres from the Polish border and only 40 kilometres from Lithuania, its cultural and administrative importance within the former Grand Duchy of Lithuania and later in the time of the influential Polish-Lithuanian Commonwealth goes back over 750 years. Catholic and Polish influences abound here, as most notably exhibited in the form of the majestic 17th century Jesuit Farny Cathedral, located centrally on Savieckaja Square. The exquisite high Baroque altars, one of which is 21 metres high, should not be missed. Only a few hundred metres away, the frontage of the lovely Bernadino Church and Seminary high above the Nieman river affords fine views across the lower town, framing the unusual Drama Theatre, the Fire Tower and the Old and New Castles in the foreground. Beyond and well worthy of a visit stands the Kaložskaya Church of St Barys and St Hlieb, the oldest remaining building in the city. Probably the only surviving example of the ancient style of Black Ruthenian architecture in the country, much of the original stonework of this lovely church dates from the 12th century. Almost due south and 232 kilometres away in the south-western corner of the country lies the city of Brest. Situated on the pan-European E30 highway and the main Berlin to Moscow railway line, Hitler unleashed Operation Barbarossa here in 1941. The 19th century fortress, one of the country’s major visitor sites, withstood a fearsome onslaught for six weeks. The title of Hero-fortress was bestowed after the Great Patriotic War to honour the heroism and self-sacrifice of the defenders during the early months of Barbarossa, the city itself also being honoured as “Hero City of the Soviet Union”. Today, travellers with an interest in 20th century European affairs will find much in this somber and moving place to fire their imagination. And the Biarescie Archaeological Museum in the grounds of the fortress should not be overlooked. Only a handful of kilometres from the European Union, this city has all the hustle and bustle of a true border town. Closer to Warsaw than to Minsk, Western cultural influences predominate. 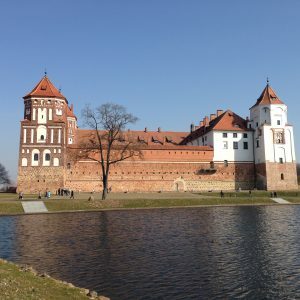 160 kilometres due east of Hrodna on the M11 motorway lies the town of Lida with its mighty castle, boasting huge walls and a high level walkway connecting two of the imposing corner towers. Construction began in the middle of the 14th century. The site measures 80 metres square, making this one of the largest castle complexes in the country. Similar to Lida in design and style, the 16th century Mir Castle and Fortress is one of the country’s UNESCO World Heritage Sites. Only 90 kilometres from Minsk, this sympathetically renovated fairy-tale castle of sublime décor and sumptuous exhibits easily repays the close attention of visitors. Just half an hour away by road stands another UNESCO site, the historic settlement of Niasviž with its glorious palace. Surrounded by a charming lake and beautifully landscaped grounds, opportunities to promenade abound at this splendid site, one of the finest historical locations in the entire country. A visit to ancient Navahradak, once the capital of the Grand Duchy of Lithuania, splendidly complements a visit to these castles and palaces. Around 45 minutes’ drive from Mir, the 14th century castle now lies in ruins, though renovations are under way. Its location atop a hill 323 metres above sea level, one of the highest points in the country, dominates the town and the surrounding area, making it easy to appreciate its strategic value in times of medieval warfare. The town also has a number of sites (including an interesting museum) devoted to the life and works of Adam Mickiewicz, national poet of Belarus, Poland and Lithuania, who was born here and christened in the church on the hill below the castle. Only 70 kilometres north of Brest, the magnificent Bielaviežskaja Pušča State National Park and Biosphere Reserve, a third UNESCO World Heritage site, should be considered one of the country’s ‘must see’ sites. It came into existence as a park over 600 years ago, though its original status as a playground for Polish princes and Russian tsars has now far been exceeded. The first class Museum of Nature presents a fine guide to the history of the park as well as comprehensively describing current attractions, while tourist trails on foot, on horseback and by bicycle abound outdoors. European Union visitors entering the park from Poland no longer require a Belarusian entry visa, although the process of applying for exemption presents no less a challenge than the visa application itself! Four hotels await in and just outside the park, each with decent facilities for nourishment and relaxation. I have stayed at Hotel Number Three, just inside the park gates. Although a little shabby (dating as it does from the Soviet era), visitors to this place of peace and beauty will doubtless be seeking to return to the simplicities of life and nature. In that context, expect to find the rooms basic but clean. All have en-suite facilities. I have one word of caution if visiting here though; do think carefully before stepping inside the Valeri animal enclosure. All of the animals and birds in this section of the park are caged. Many of them appear to exhibit distress and in particular, I found the sight of two brown bears in a state of considerable discomfort outside their natural environment particularly upsetting. Although the only negative experience in an otherwise delightful place, it remains a significant one. Belarus has so much to offer beyond the attractions of its capital city. Those with an open and enquiring mind who step outside the boundary of the Minsk orbital road will not be disappointed by all they find there. Nigel is a freelance travel writer specialising in Belarus and is based in the UK.